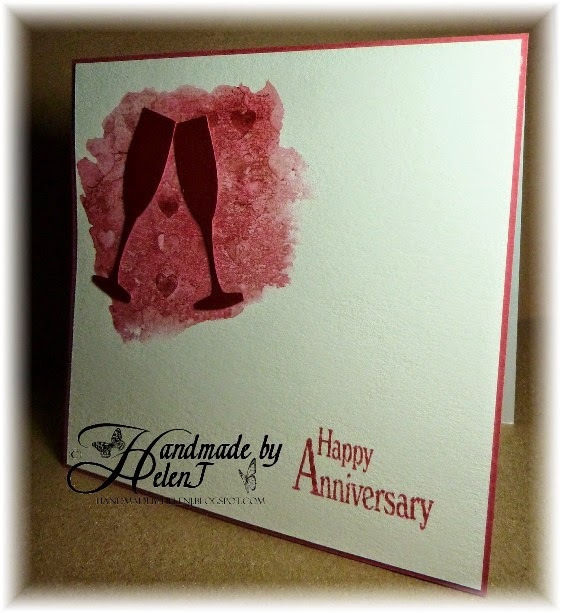 I loved the card which is the inspiration for this week’s Muse challenge. 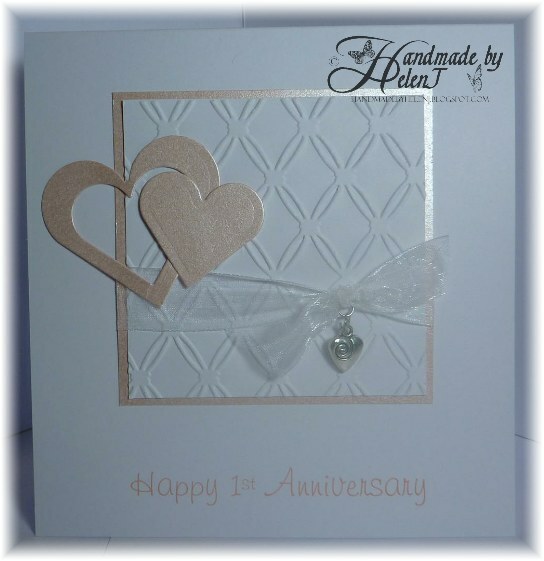 Although it’s a very CAS card it has lots of little details in the die-cutting and I knew I could recreate this with some dies which I purchased recently off that well-known auction site. 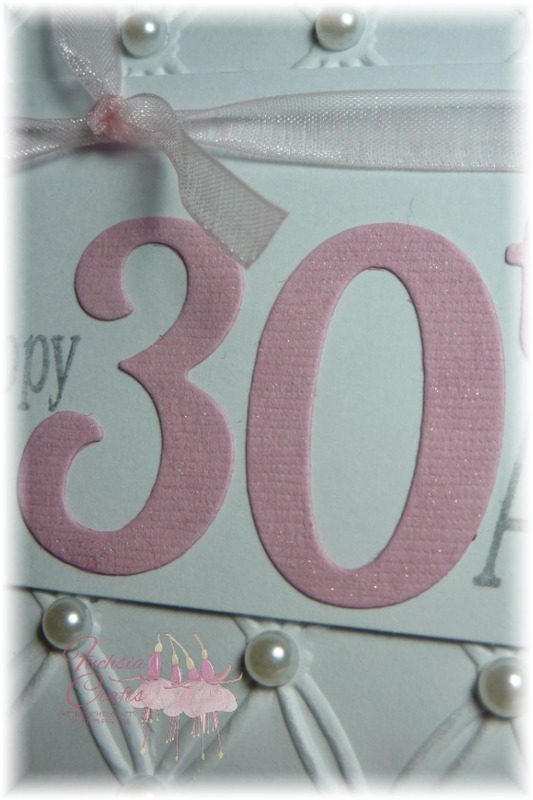 The dies are by MFT and I cut the background from Docrafts adhesive-backed silver paper. The oval dies are by Spellbinders and the gem is from my stash. The greeting is by Papertrey Ink. 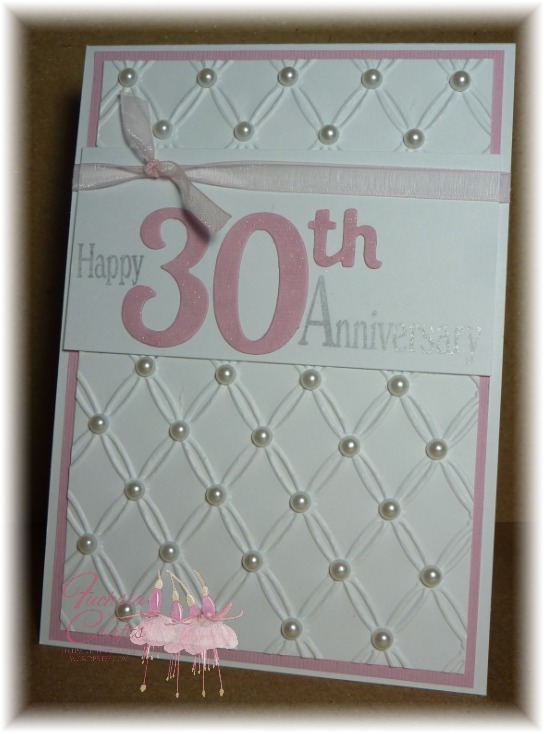 My brother & his wife celebrate their pearl (30th) wedding anniversary in a few days and this card is from my mum to them. I liked the sketch over at Retro Sketches so it’s based on that. 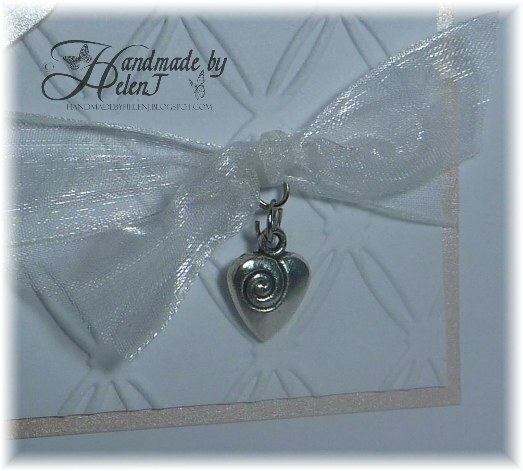 I’m also entering this over at Creatalicious Challenges, where the theme is Ribbons & Pearls – plenty of the latter here! 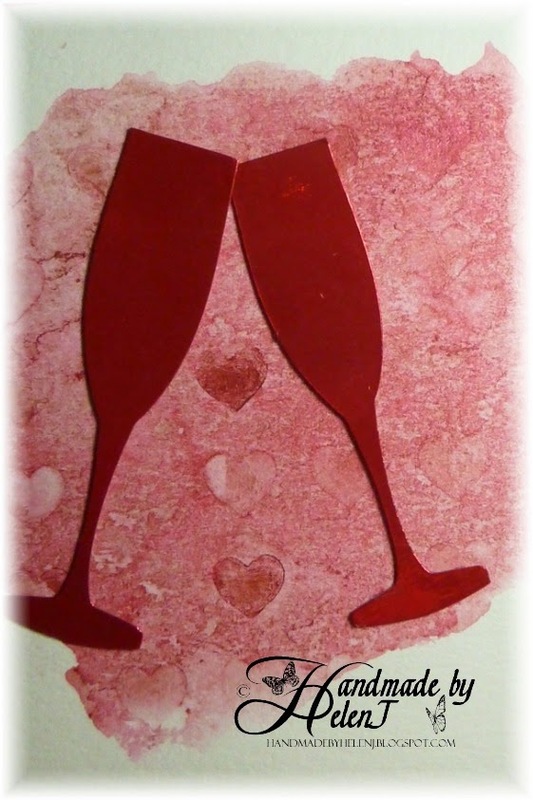 The background uses a stencil I cut on my Sizzix Eclips and Cosmic Shimmer Iridescent Watercolour paint. The glasses were also cut on the Eclips, and the greeting was stamped in Memento Rhubarb Stalk. Here’s a picture showing the background a little more closely, although you can’t see the sheen of the paint, unfortunately. The stems were painted in an olive green colour from my Whispers brush markers set, and I think I’ll make this my final entry into the challenge over at Stamping Sensations, where “Anything Goes”. No, not a Valentine’s card, this time it’s for the first wedding anniversary of some friends of ours who will, sadly, be attending the funeral of the husband’s Mum on their special day. I wasn’t sure that “Happy 1st Anniversary” was appropriate but I hope they’ll still be able to celebrate in some way. 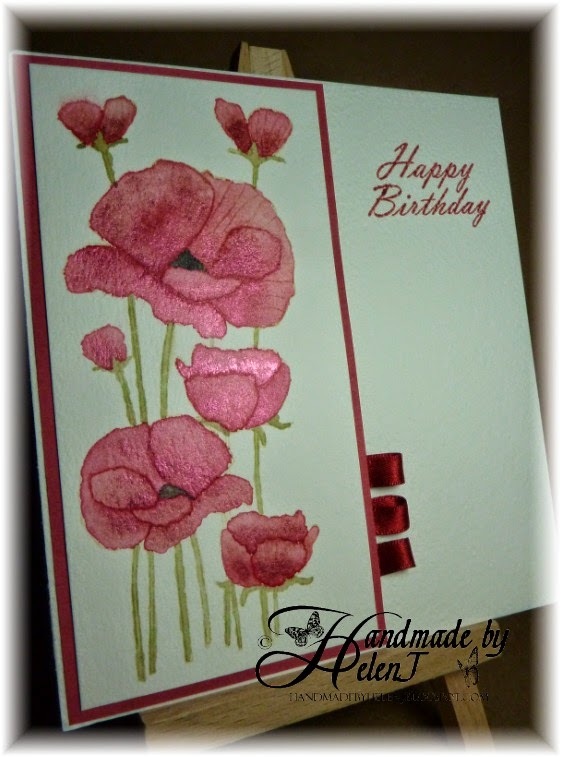 I was inspired by this beautiful card but have varied it slightly, partly because I don’t have the same dies & embossing folders but also because I never like to copy someone else’s work exactly.